Boreal will open to the publci on Friday, Nov. 9, becoming the first resort in California to open for the 2018-19 season. For the fifth straight year, Boreal Mountain Resort will be the first in California to open to the public. 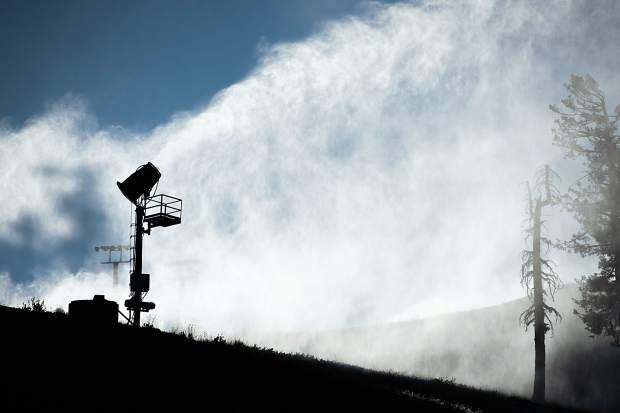 The resort recently announced Friday, Nov. 9, as the 2018-19 season opener, and will be spinning its Castle Peak lift from 2 p.m. to 8 p.m.
Boreal has been running its 20 snow guns as much as conditions have allowed in anticipation of opening day, and will be the second resort in the Lake Tahoe area, behind Mount Rose Ski Tahoe, to open for the season. Dawson said Boreal will have between six and eight park features set up for the season opener. The resort is planning to expand hours following Friday, and will be open Saturday through Monday from 9 a.m. to 9 p.m. The first 50 people in line for Friday’s opening day will receive a “special prize,” according to Dawson. Lift tickets will be available at the mountain for $39. For the latest information on lift openings and hours of operation visit RideBoreal.com.